Practice Area: Practice area includes a 10-acre lighted driving range with Bermuda grass tees, short-game area and putting green. The facility is open daily during the Spring and Summer seasons until 9pm. Description: Daily fee public course designed by Arnold Palmer and located off the popular Birkdale exit of I-77, north of uptown Charlotte. 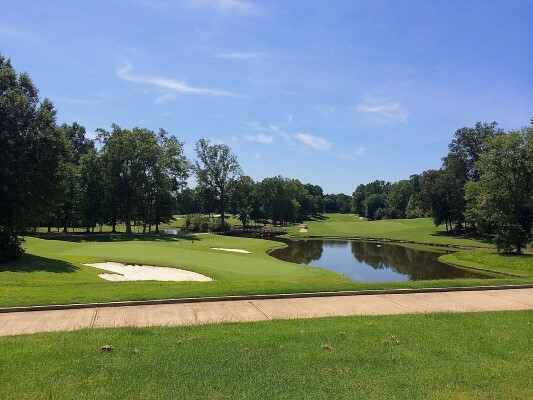 Located on 200 acres of rolling terrain, carved between tall pines and natural streams, Birkdale is a challenging 7,013 yard, par 72 course made up of Bermuda fairways and Crenshaw bent grass greens, offering a true test of golf skills. Notes: Birkdale came under new management in April 2014 -- keep that in mind when looking at older reviews. The course offers memberships and is part of the Queen City Passport loyalty program with several other local courses -- The Divide, Tradition, Highland Creek, and Waterford. B-Man's Take: I used to play here once or twice a season, but not in some time due to the course management issues of the past several years. The course has many challenging holes with some tough carries over trouble. Many holes have doglegs and a couple of short par 4's are almost drive-able. The par 3 holes are all pretty tough. Watch out for the 569yd par 5 5th hole where your 3rd shot must carry water to reach sucker pins in the front right corner. And good luck on the 436yd par 4 18th hole, which also has a tough carry over water and bunkers to a sloped green. This course has a great layout and would be a favorite of mine if the conditions were better and more consistent. If you play here, please post a review. If I hear it has turned around, I'll go play it again.